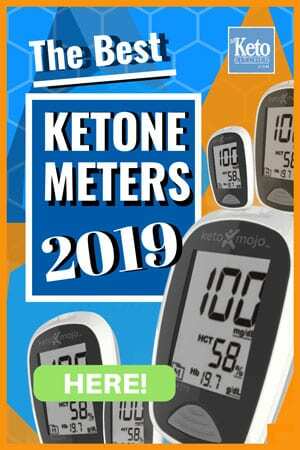 These Keto Anzac Cookies are a low carb twist on an Australian biscuit that dates back to World War I. The original cookies were sent by wives and women’s groups to the soldiers fighting on the front line. 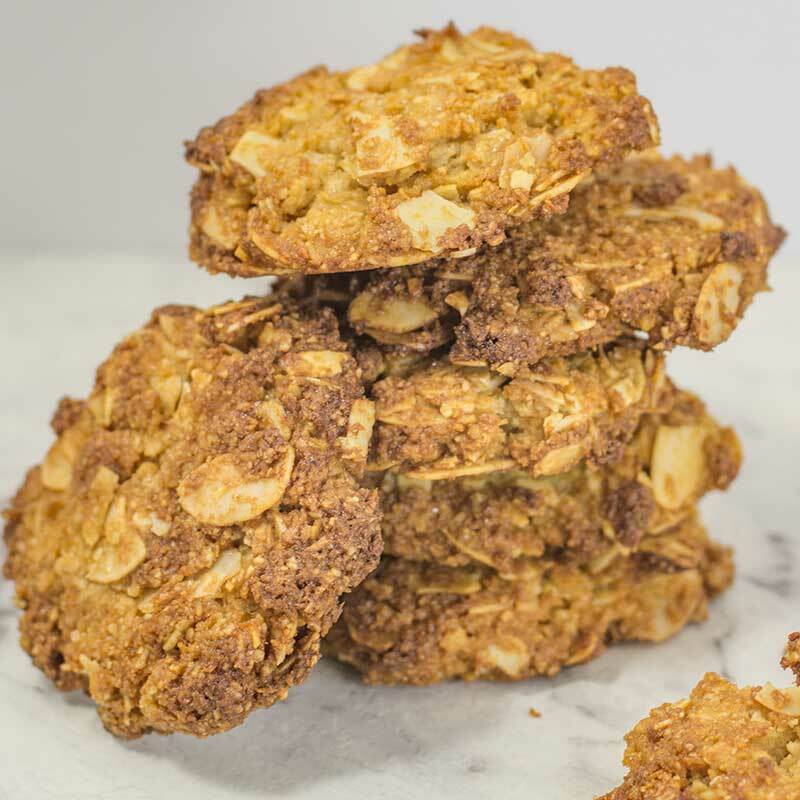 Our Low Carb Anzac Cookies are a little different to the original, swapping out oats and flour for almonds, the sugar for sweetener and adding an egg to keep it all together. For Anzac cookies, there are two types of people – crunchy cookie lovers and chewy cookie lovers. Our recipe is perfect for chewy lovers. Australians and New Zealanders remember those who served their countries on ANZAC Day – April 25th. For the crunchy cookie lovers, I recommend pressing your cookies thinner and baking in the oven for about 5 minutes longer. This Keto cookies recipe makes 12 cookies. 1 serve is one cookie. These low carb Anzac cookies are best eaten on the day they are cooked as they will soften overnight – which is great if you love chewy cookies! Preheat your oven to 150C/300F. Prepare a cookie sheet by lining with parchment paper. Place the flaked almonds on your cookie sheet and toast for 8-12 minutes until crunchy and lightly browned. Set the sheet aside to be re-used for the cookies. 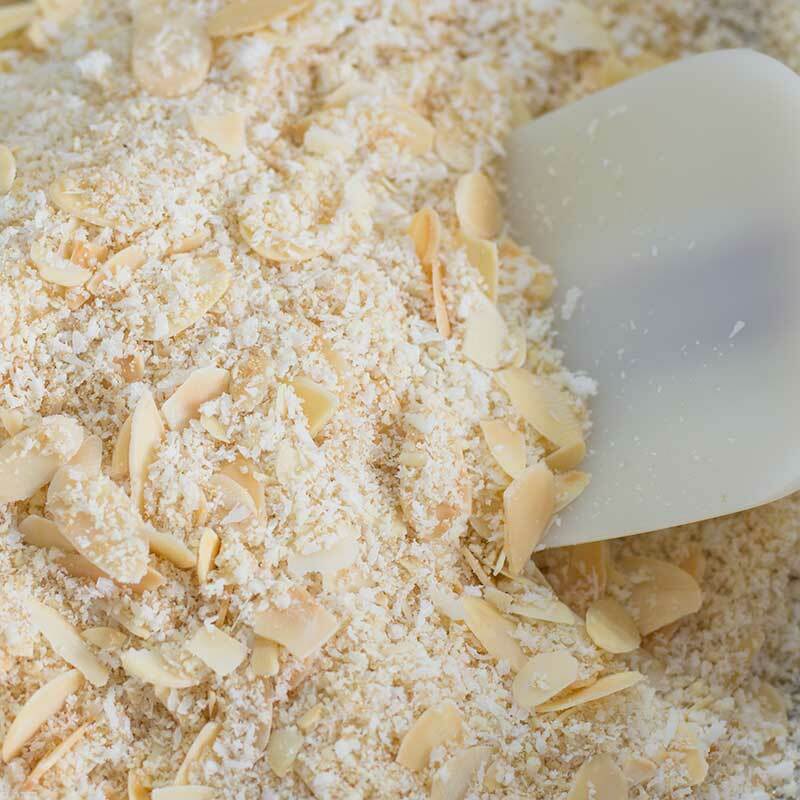 In a mixing bowl, add the flaked almonds, almond flour, coconut, sukrin gold, and xanthan gum, mix well. Place the butter and sukrin fiber syrup in a small saucepan and place over medium heat. Once the butter has melted and is starting to bubble, add the bi-carb soda and mix well. The mixture will turn thick and foamy. Pour into the dry ingredients and mix in before adding the egg. Mix well. Scoop out spoonfuls of the cookie mixture onto the cookie sheet. We make ours about the size of 2 tablespoons. Press the cookies into circular shapes about 8mm/ ⅓ inch thick. Bake for 12-18 minutes (for chewy cookies) until the cookies are golden brown and feel firm around the edges. Enjoy while they are soft and warm or leave to cool for 15 minutes. Store cooled cookies in an airtight container. Keto Anzac Cookies - Low Carb Traditional Biscuits - EASY to Make! 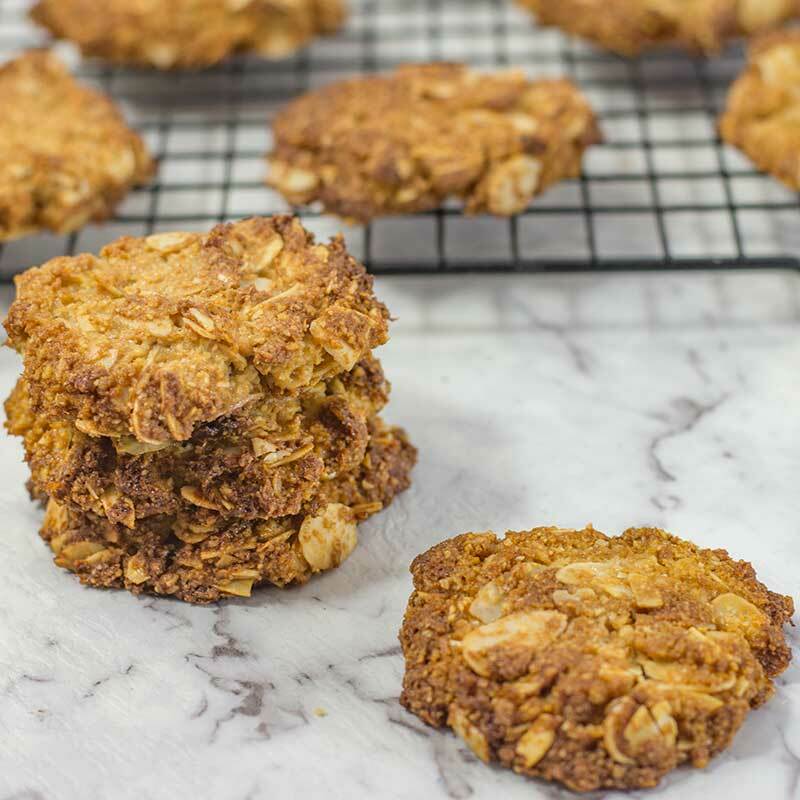 These Keto Anzac Cookies are our low carb twist on an Australian biscuit that dates back to World War I. The original cookies were sent by wives and women’s groups to the soldiers on the front line. 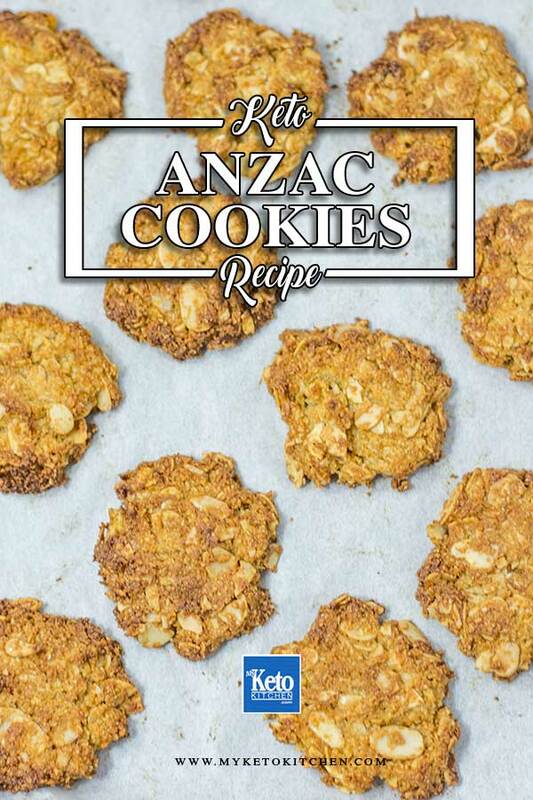 To make a larger batch of this Keto Anzac Cookies recipe adjust the servings above.